Removal To Spain From UK - Where Is The Most Popular Place For Ex-Pats To Live? Removal to Spain from UK is happening more and more often, with many British people wanting to live in Spain full time. They have done their research and understand what it will take to move to Spain, but where exactly do they plan to go and live? Here, we look at the most popular areas people move to. The Costa Brava is a particularly popular spot for people from the UK to settle when they choose removals to Spain. The Costa Brava is just one hour away from the Pyrenees, is right on the border with France, and it is also on the coast. This means that it has a lot to offer, but it is also one of the most expensive places in Spain to buy a house. If your budget is a little lower than the �1 million average of the Costa Blanca, then you may want to consider the Costa Dorada (South Catalonia) when looking for removals to Spain from UK. The Costa Dorada�s properties start at around �100,000 for a well-appointed apartment, and detached villas on the beach (or within walking distance) are closer to �250,000. If you are looking for a project and for some land � perhaps to start a business with � then rustic inland villas within hectares of olive groves could be snapped up for around �150,000. Prices in this area have risen by 10 percent over the past few years, but they are still much lower than in other Spanish locations. The Costa Dorada (the golden coast) is particularly beautiful, and it is quieter than some other areas. No matter which area of Spain you are planning to move to, Advance Moves can get you there. 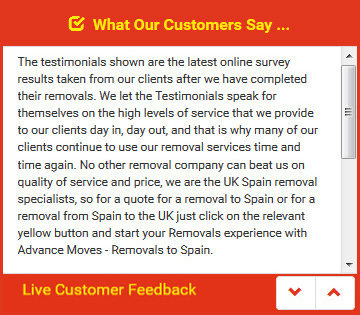 Our personal experience will help with your removal to Spain from UK. See our website at http://www.advancemoves.com/ to use our quick quote system. If you have any questions, please contact us on 0871 218 0612 or info@advancemoves.com.